Preheat oven to 220°C/ 200°C fan-forced. Line a large baking tray with baking paper. Heat pine nuts in frypan until lightly toasted. cool then add to mince. Combine meat, breadcrumbs, sauces, parsley and onion in a bowl. Season with pepper. Cut pastry sheets in half (rectangles). For 1 sausage roll, spoon a quarter of meat mixture along one long side of each pasty piece. Roll to enclose filling. Cut each roll into 3 pieces. Place on prepared tray. Brush tops with egg; sprinkle with almonds. Bake for 20 minutes or until pastry is golden. 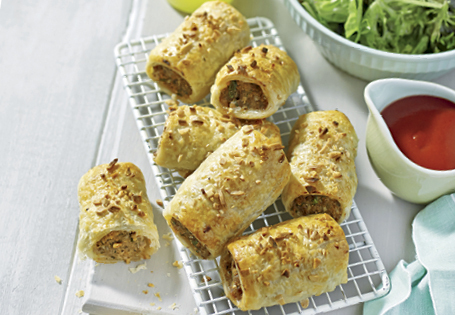 Serve sausage rolls with lettuce and extra sauce.